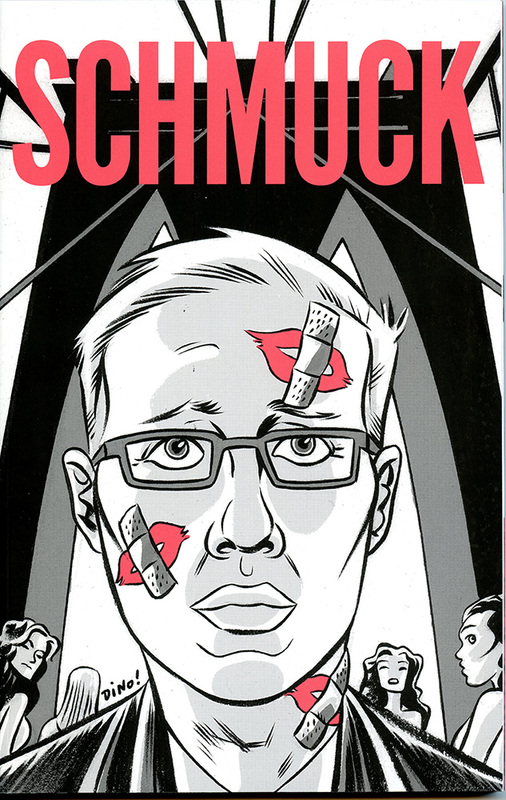 Seth Kushner’s long-awaited graphic novel SCHMUCK came in the mail today. His story, in comic form, of how he eventually found love and happiness was released posthumously. Seth died about six months ago after a prolonged battle with cancer, leaving behind his wife and their young son. I opened the package and held the book in my hands. I began by fixing my gaze on Dean Haspiel’s cover, featuring Seth’s lipstick-kissed, but bandaged face– with those intense eyes of his, protected behind glass, like twin lenses in some strange and powerful camera focusing out into some half-dreamed, half-imagined future happiness which only he could see. I first met Seth in 2009, a few months after I was chosen as one of four artists in what came to be known as The Pekar Project. We were to draw new and original stories by Harvey Pekar of American Splendor fame. These short, illustrated comics stories would then be presented online. It was the first time Mr. Pekar, who famously could neither “draw a stick figure” nor “turn on a computer” had written anything for the web, which was still fairly new at the time and Harvey Pekar was always looking to reach a new audience. Harvey was in Brooklyn for KING CON and I was invited, along with the other artists, to have my photograph taken with the legendary autobiographical comics writer by Seth Kushner, who was a young, and a rather successful, well-known and highly-regarded portrait photographer who specialized in portraits of people in the arts. On the appointed Saturday morning, we all gathered in a former bath house on Fourth Avenue in Brooklyn, which is where KING CON 2009 was being held. There was no heat in the cavernous old building, but there was enough excitement in the air and in the growing alternative independent comics scene to make one’s heart pump a little faster than usual, and the result was a building full of warm hearts. It also didn’t hurt that several pretty young women with scarfs on their heads were selling hot coffee and homemade muffins in one of the rooms right outside where we were gathered as we waited for Mr. Kushner and his camera to make their appearance. It wasn’t long before Seth suddenly appeared– and in a few minutes, with his left arm bent at the elbow and holding his camera at the ready near those two eyes, and using his right arm and hand and his gentle voice, he expertly directed the assembled menagerie of Pekarians into position for a series of group pictures. Then, one-by-one, he disappeared with the individual members of the group for their portraits, naturally taking many photographs of Mr. Pekar. Finally, it was my turn and I was briefly introduced to him and we took a few steps toward a nearby doorway, which, oddly enough, we never went through. In a matter of seconds, he had taken several shots of me as I turned to see if he was still following me. He seemed satisfied with the effort and I was relieved to have it over with. In the resulting pictures, he managed to capture the deep insecurity and a feeling of being somehow separated from others that I think I have been struggling my whole life to overcome. I have had some successes in life and was feeling pretty good about myself that day. And of course, he caught it effortlessly, without having to utter a single word of direction. I suppose that is the mark of a great photographer. To see beyond the surface, to see what others can’t see–or don’t see–or prefer not to see– and to see past their subject’s exterior and directly into the heart of their subject, that final refuge where nothing can ever hide. And then, to be able to put it right out there for all the world to see, well, that’s art. That’s the kind of artist Seth was. That night we were all invited to a big party in a brownstone in Brooklyn. The room was packed. I didn’t know most of them. Everyone was busy hanging up their coats or talking– or getting a drink from the bar– and I stood off to the side and surveyed the crowd. There was Seth standing in the middle of it all. He seemed to be the only one who wasn’t actively engaged in speaking with someone or doing something. This time, instead of a camera in his hand, he held a glass. He looked to me to be a lighthouse in stormy waters. I put my back into it and rowed toward his island. He never saw me coming. His eyes were busy looking around the room, taking it all in– processing information. He was taking images with his mind and not his camera. I walked right up to him and we had the most pleasant conversation. I told him that I was really interested in photography and he told me that he was very interested in comics. Often, at a party like this, someone will come over and interrupt a great conversation you’re having right in the middle of it, but for once, that did not happen. We talked amicably in this manner for about ten or fifteen more minutes. I felt a real connection with him and I’d like to think he felt the same way about me. Finally, I felt that I had taken up enough of his time and I thought I should allow him a chance to mingle with the other guests, so I excused myself and made a polite getaway. Fifteen minutes with me should be more than enough for anyone. A few months later, Seth called me on the phone as our family was packing up for a move to another state. He told me that he really liked my artwork and that he had written an autobiographical story and wanted me to help illustrate part of it. I confessed to him that I was flattered to have been asked, but I was preoccupied with the move and didn’t think that I could devote the time and attention to his project that it no doubt deserved. He was nice about it, and let me off the hook, but I could hear the disappointment in his voice. Now that five years have passed since that conversation, I think I can safely say that not agreeing to do a story for Seth Kushner is now high on my list of life’s regrets, a list I am carrying around in a little leather notebook somewhere in the back of my mind. Not working with Seth was a mistake. It was a bad time when he asked. One thing I realize years later, is that it’s never the perfect time and you have to say YES!! to every good opportunity that comes your way. “Live and learn”, they say. …and I hope I am still doing both. Seth is gone now and I will never have another chance to work with him. But I can not WAIT to read his book.